People seem to be finally losing their patience with the whole pranks and social experiment fad. With pranksters often over-stretching reasonable boundaries, just for the sake of a few video views, you can kind of understand why. 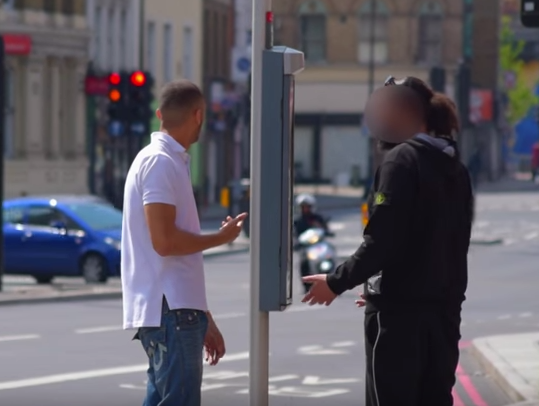 But this guys reaction to this pretty harmless prank was just full-blown ridiculous. This is the moment that a YouTube prankster has a knife pulled on him by one of his ‘victims’ during a video. Filmed in south-east London, the prankster awkwardly approaches members of the public to ask them for directions. When they answer to try and help him, that’s when he tells them not to raise their voice at them or says ‘don’t tell me what to do’. It was all going so well until he picked out his next target in Deptford, who definitely didn’t see the funny side of this particular prank. 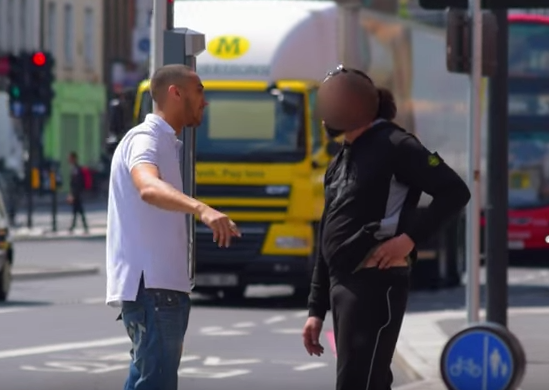 The prankster rudely asks the man to stop bossing him about, before the ‘victim’ becomes aggressive. He lifts up his shirt to reveal what appears to be a knife as a blatant threat to the joker. Luckily, he was able to calm the down man down after explaining that he was just shooting a video. When he pulled out the blade I was initially scared, I was frightened, but I think I managed to calm the situation down. I have been in that kind of situation before if you get me. You just have to pick the right people I guess. Too right you do! Many YouTube commenters have accused him of faking it, by either arranging the encounter or by not using a real knife. It’d be pretty depressing sign of the times if he genuinely faked this whole scenario just for the sake of 15 minutes of fame.